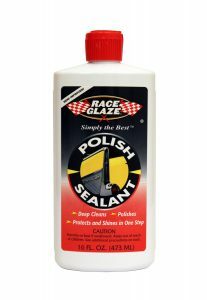 Race Glaze Polish & Sealant is three products in one bottle. A durable yet breathable clear poly/aminofunctional siloxane protective coating. It protects against fading, acid rain and harsh airborne pollutants. Fast and easy to apply. A breathable sealant barrier of protection. Removes tar, sap, fine scratches, stains. Great results by hand or machine buffing. For porous plastic body molding surfaces use Race Glaze Auto Trim & Leather Renewer. Manual- Get professional results when product is applied and removed with anti-static detail pads or cotton applicators. Product reviews that appear on this site come from Amazon Services, LLC. This content is provided "As Is" and is subject to removal at any time. A variety of online retailers and local stores carry Race Glaze products. Click here to find a retailer or buy online from a trusted retailer. Learn about the history of Race Glaze and why it has become the preferred choice of thousands over the past 30 years. © 2019 ChemRite CoPac, Inc.